In this book, leading data warehouse experts from the Kimball Group share best practices for using the upcoming “Business Intelligence release” of SQL Server, referred to as SQL Server 2008 R2. In this new edition, the authors explain how SQL Server 2008 R2 provides a collection of powerful new tools that extend the power of its BI toolset to Excel and SharePoint users and they show how to use SQL Server to build a successful data warehouse that supports the business intelligence requirements that are common to most organizations. Covering the complete suite of data warehousing and BI tools that are part of SQL Server 2008 R2, as well as Microsoft Office, the authors walk you through a full project lifecycle, including design, development, deployment and maintenance. Now widely adopted as the de facto industry standard and sanctioned by the Object Management Group, the Unified Modeling Language (UML) is a notation all software developers need to know and understand. However, the UML is a big language, and not all of it is equally important. The award-winning first edition of UML Distilled was widely praised for being a concise guide to the core parts of the UML and has proved extremely successful in helping developers get up and running quickly. UML Distilled, Second Edition, maintains the concise format with significantly updated coverage of use cases and activity diagrams, and expanded coverage of collaborations. It also includes a new appendix detailing the changes between UML versions. Written for those with a basic understanding of object-oriented analysis and design, this book begins with a summary of UML’s history, development, and rationale and then moves into a discussion of how the UML can be integrated into the object-oriented development process. The primary author profiles the various modeling techniques in the UML–such as use cases, class diagrams, and interaction diagrams–and describes the notation and semantics clearly and succinctly. He also outlines useful non-UML techniques such as CRC cards and patterns. These descriptions are made even more relevant with a collection of best practices based on the primary author’s experience and a brief Java programming example demonstrating the implementation of a UML-based design. With this tour of the key parts of the UML, readers will be left with a firm foundation upon which to build models and develop further knowledge of the Unified Modeling Language. Today, information-technology business analysts are often working on object-oriented (OO), Unified Modeling Language (UML) projects, yet they have a long way to go to exploit the technology beyond the adoption of use cases (just one part of the UML). This book explains how, as an IT business analyst, you can pull together all of the UML tools and fully utilize them during your IT project. Rather than approaching this topic theoretically, you will actually learn by doing: A case study takes you through the entire book, helping you to develop and validate the requirements for an IT system step by step. Whether you are a new IT business analyst; an experienced analyst, but new to the UML; a developer who is interested in expanding your role to encompass IT business-analysis activities; or any other professional tasked with requirements gathering or the modeling of the business domain on a project, you’ll be trained and mentored to work efficiently on UML projects in an easy-to-understand and visual manner. This new edition has been completely updated for UML 2.2, and includes coverage of all the relevant new BABOK 2 knowledge areas. The new edition also covers various lifecycle approaches (non-empirical, empirical, waterfall, iterative, and agile) and their impact on the way project steps are carried out. The future belongs to a different kind of person with a different kind of mind: artists, inventors, storytellers-creative and holistic “right-brain” thinkers whose abilities mark the fault line between who gets ahead and who doesn’t. Drawing on research from around the world, Pink outlines the six fundamentally human abilities that are absolute essentials for professional success and personal fulfillment-and reveals how to master them. A Whole New Mind takes readers to a daring new place, and a provocative and necessary new way of thinking about a future that’s already here. I two items are not exactly the same, then make them different. Really different. Creating contrast is just fun. Add contrast through your typeface choices, line thicknesses, colors, shapes, sizes, space, etc. Repeat some aspect of the design throughout the entire page. Create repetition to enhance the design and the clarity of the information. Be conscious of the value of contrast. Nothing should be placed on the page arbitrarily. Every item should have a visual connection with something else on the page. Avoid using more than one text alignment on the page. Avoid too many separate elements on a page. Make contrast with type, size, weight, form, structure, direction, and color. Contrast heavy weights with light weights, not medium weights. Warm colors come forward; cool colors recede. Experiment with the colors of black text. Think more in terms of horizontal type versus tall, narrow columns of type, rather than type on a slant. Caps versus lowercase is a contrast of form, as well as roman versus italic or script. Scripts and italics have similar forms-don’t combine them. Never put two typefaces from the same category on the same page. Never put two sans serif typefaces on the same page. Combining sans serif with serif is a time-tested combination. Name the problem, then you can create the solution. Find similarities-not the differences. Web applications are the front door to most organizations, exposing them to attacks that may disclose personal information, execute fraudulent transactions, or compromise ordinary users. This practical book has been completely updated and revised to discuss the latest step-by-step techniques for attacking and defending the range of ever-evolving web applications. You’ll explore the various new technologies employed in web applications that have appeared since the first edition and review the new attack techniques that have been developed, particularly in relation to the client side. Focusing on the areas of web application security where things have changed in recent years, this book is the most current resource on the critical topic of discovering, exploiting, and preventing web application security flaws. The form is the solution to the problem. The context defines the problem. The form is a diagram of forces. What does make design a problem in a real world case is that we are trying to make a diagram for forces whose field we do not understand. Understanding the field of the context and inventing a form to fit it are really two aspects of the same process. We are searching for some kind of harmony between two intangibles: a form which we have not yet designed, and a context which we cannot properly describe. The measure of a design is how well it fits into the world around it. In the unselfconscious culture the same form is made over and over again; in order to learn form-making, people need only learn to repeat a single familiar physical form. In the selfconscious culture new purposes are occurring all the time. A culture is unselfconscious if its form-making is learned informally, thorough imitation and correction. A culture is selfconscious if its form-making is taught academically, according to explicit rules. An unselfconscious culture made beautiful crafts by standing in the long tradition, and by making minor changes whenever something seemed to need improvement. Here is the problem. We wish to design clearly conceived forms which are well adapted to some given context. The starting point of analysis is the requirement. The end product of analysis is a program, which is a tree of sets of requirements. The starting point of synthesis is the diagram. The end product of synthesis is the realization of the problem. The constructive diagram can describe the context, and it can describe the form. The form’s basic organization is born precisely in the constructive diagrams which precede its design. Presentation designer and internationally acclaimed communications expert Garr Reynolds, creator of the most popular Web site on presentation design and delivery on the net — presentationzen.com — shares his experience in a provocative mix of illumination, inspiration, education, and guidance that will change the way you think about making presentations with PowerPoint or Keynote. 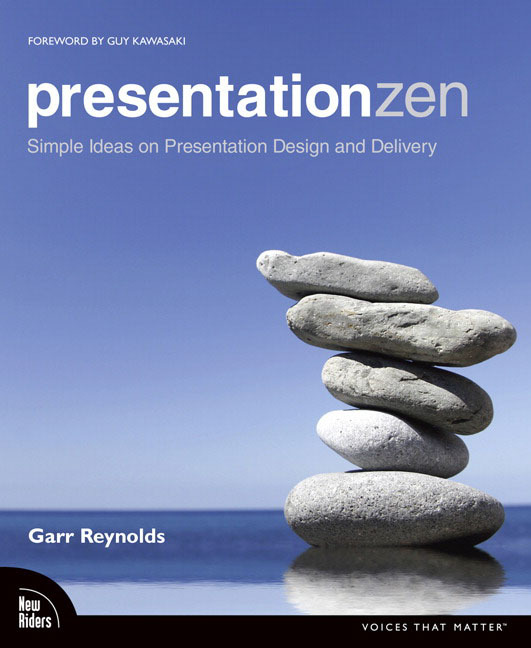 Presentation Zen challenges the conventional wisdom of making “slide presentations” in today’s world and encourages you to think differently and more creatively about the preparation, design, and delivery of your presentations. Garr shares lessons and perspectives that draw upon practical advice from the fields of communication and business. 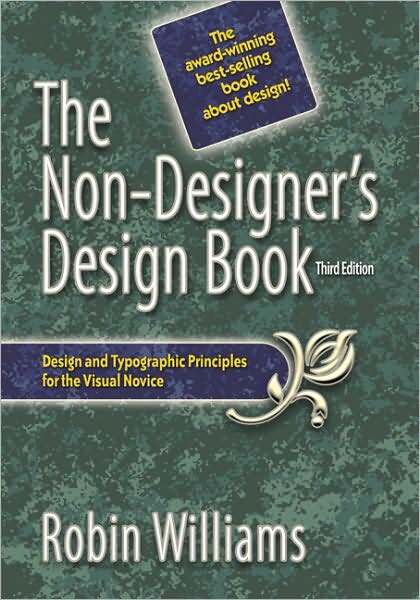 Combining solid principles of design with the tenets of Zen simplicity, this book will help you along the path to simpler, more effective presentations.